Camping can be a really exciting experience, and if you have chosen to go, you probably want to enjoy the nature to the max, and not sit next to the pot and wait for your meal to be done. Besides, if you don’t have a lot of room in your trunk, you shouldn’t be forced to clutter it with portable stove and pot. Cleaning the camping set is also not among the best ways to spend your time outdoors. Fortunately, there are plenty of ways to enjoy the beautiful natural surrounding without starving to death. 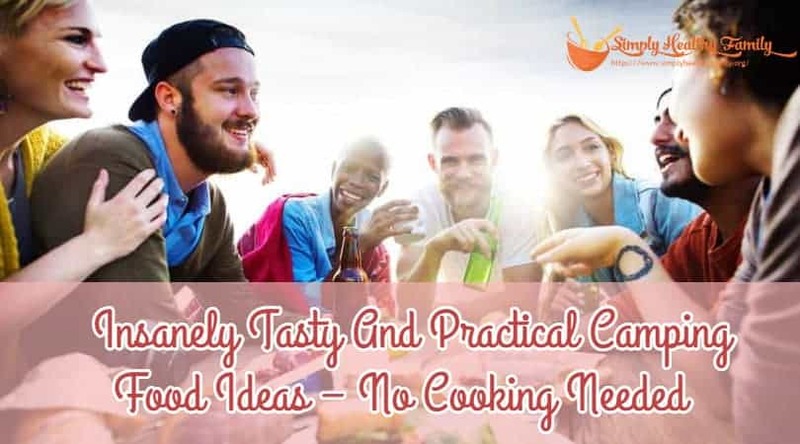 We’ll give you some fantastic camping food ideas that require no cooking on site, to spark your imagination. Wraps and burritos are a perfect treat for camping. They could be really filling, but also healthy if you chose ingredients that are low in calories and fat. The trick about making the perfect burrito is creating a balance of flavors. If you are using heavier staples of meat of meat, beans, and rice, you should balance them with lighter additions of greens, guacamole and sour cream. They should be wrapped to fit nicely in your hand and for all the ingredients to stay inside while you are eating. To prepare them you will need large tortillas and ingredients of your choosing. 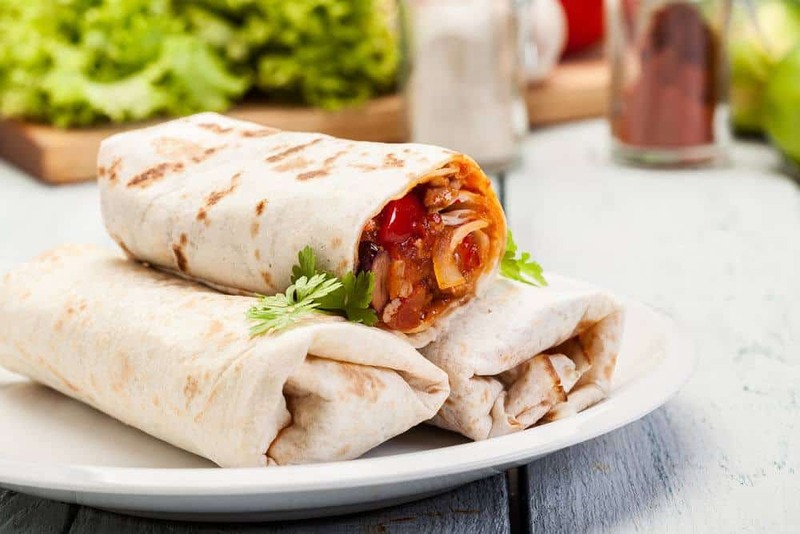 If you are going to fill the burritos on site, you can pack some handy no-cook ingredients like smoked chicken, smoked salmon, canned beans, canned pineapples, etc. So, you are waking up in your tent, getting up and breathing in some fresh air, but suddenly you feel hungry. What are you going to eat for breakfast? Omelette is not an option. You can choose a hearty, healthy breakfast, such as granolas and cold cereals. You can pre-pack the ingredients in air-tight jars and just pour cold water or milk when you are ready to eat. Energy bars were good enough for astronauts flying into space, so why wouldn’t they be good enough for campers? You can buy a stack of healthy energy bars with less sugar and natural ingredients, or you can prepare your own the day before you go camping. Use ingredients like rolled oats, pumpkin seeds, dried figs, sunflower seeds, etc. 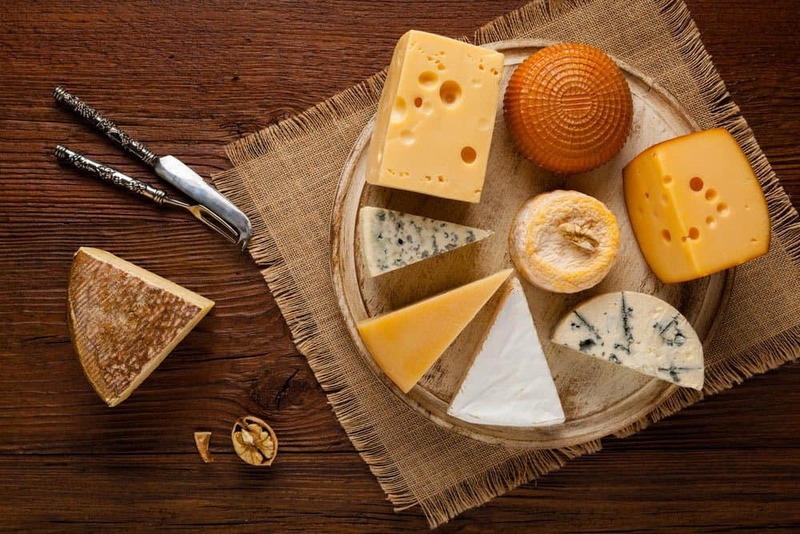 Not all cheeses can be kept outside of the fridge for a long time, but there are some types that can. Those are mostly hard cheeses such as Cheddar, Asiago, Swiss and Parmesan. Still, you need to know how to store them properly to avoid mold and keep them fresh. Instead of using plastic wrap to protect your cheese, you should use cheese paper or cheese bags, because they protect the cheese but allow it to breathe also. Parchment and wax paper can also do the trick. Rubbing the faces of the cheese with a light coat of olive oil can also help because the mold will develop on the oil layer instead of on the cheese. Many larger grocery shops and even some camping supply outlets offer freeze-dried and prepackaged foods that require no preparation at all. They are packed in metallic bags, and they don’t require water or refrigeration. The meals include a diverse spread of dishes ranging from pasta, noodles and soups to chicken and chickpeas. You can also find pitas and wraps filled with low-fat cheese, veggies, and canned beans. Sometimes you will feel hungry but not hungry enough to eat an entire meal. What can you do in that case? 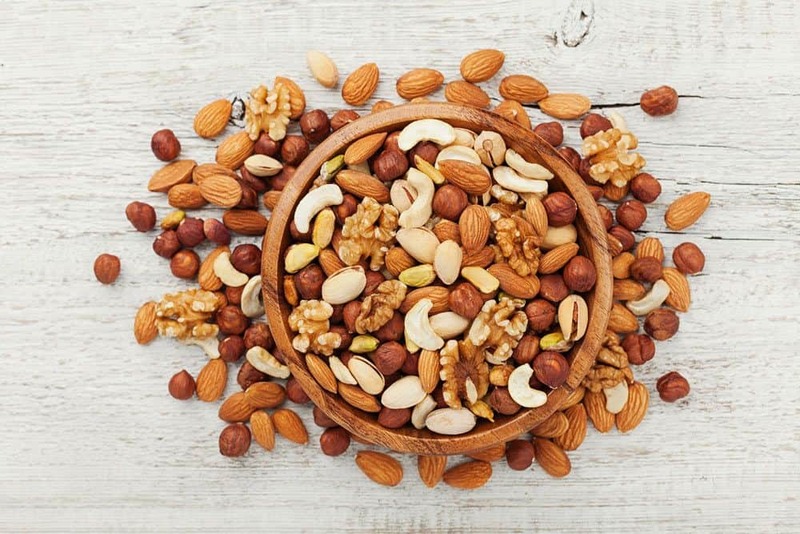 Well, you can turn to healthy snacks such as a mixture of nuts (walnuts, almonds, cashews, etc.) and dried fruits. These will immediately bring your energy levels up, so you can feel free to go hiking or play catch with your friends. Canned foods are often branded as not very nutritious and tasty. However, if you choose the right manufacturer (you can try out few different ones before your camping trip) you can end up with a delicious and filling can of bean, fruits or whatever you like. And if you want to be truly sure your canned meals are just the way you like them you should try canning your own food. Some of the things you can make are pickles, jams, preserves, and jellies. Is It Pasta Or A Salad? Both! Pasta salads are a great choice for camping lunch because they can keep your belly full for a couple of hours, even with intensive physical activity involved. 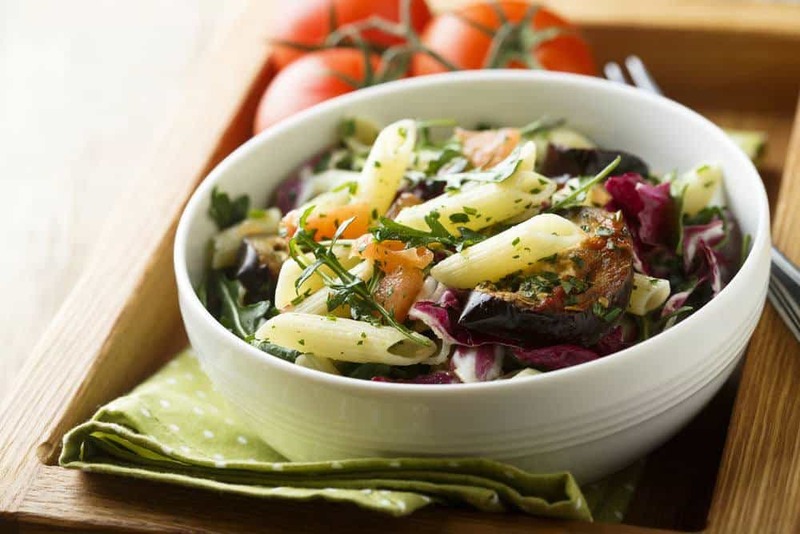 You can make your pasta salad ahead, by cooking fussily or another type of pasta, and spice it up with long-lasting ingredients such as sun-dried tomato, olives, herbs and hard cheese. Keep your pasta salad in the refrigerator the whole night before you go, and you will see how it will absorb the taste better and be simply delicious. Mason jars are heaven-sent for camping. They are perfect not only for packing cereals. You can also chop some fruits and prepare a refreshing fruit salad. Divide it into several mason jars, and you will have enough fruits for a couple of meals. If you want to keep the vibrant colors of fruits for longer and preserve the taste, you should toss them with lemon or lime juice, because the citric acid prevents them from becoming brown. Other things that can help are submerging in cold water and coating the cut surface with sugar syrup. Sure, you can bring oatmeal to camping, but you know what would be even better? Oatmeal cookies! 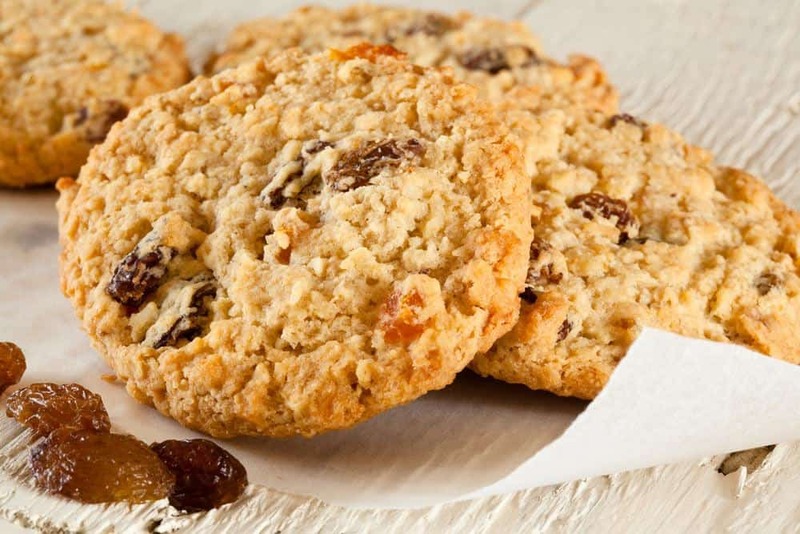 Of course, you can buy oatmeal cookies at many health food stores, but if you prepare them yourself, they can be even more delicious. They can be prepared a day or two earlier, and you can add whatever you want including huge chunks of chocolate, vanilla, and even mini marshmallows. How delicious is that? So, you have your fruits in your fruit salad, but how will you maintain a balanced diet without veggies? Greens can’t last long without refrigeration, and they soon become brownish, dry and tasteless. But you can still pack some veggies that can last longer time without refrigeration. Pack some beets (they’re good for a couple of days because they can last up to four months in the refrigerator), cabbage, carrots, celeriac, onions, winter radishes, winter squash, and rutabagas. Sounds like a good salad in the making. Camping does require some compromises to be made when it comes to food, and since it usually lasts only a couple of days, that shouldn’t be a big problem. Maybe you are not supposed to eat large amounts of salty snacks every day at home, but when camping, you can get away with that. Packing some crackers, baked potato chips, tacos, pretzel sticks, tortilla chips, sesame seed snacks and lentil chips sounds like a great idea, especially if you combine them with some dips. We mustn’t forget the king of the camping food – sandwich! Sandwiches are always a good idea. 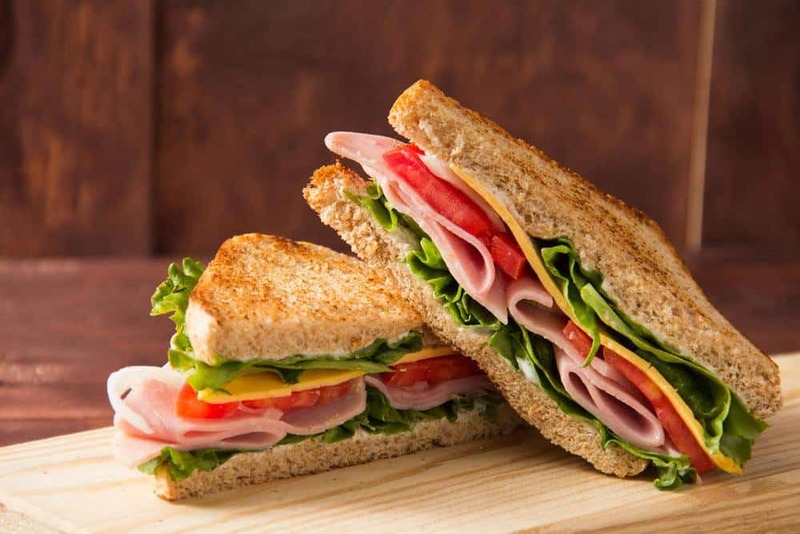 You can prepare a couple of sandwiches at home and eat them on the road or the first day, but you can also bring along packaged sliced bread and make your sandwiches in the camping site. But before that check the expiration date on the package. The best ingredients for the sandwich are also the ones that don’t get spoiled so easily when outside of the refrigerator. That can be meat products, such as pepperoni, chorizo, and salami, but also smoked products like smoked salmon and chicken breast. Finish up with a hard cheese you’ve packed for snacking, and add ketchup because it can truly survive an apocalypse. Camping is always an amazing experience, and you should spend as much time as you can truly enjoying every minute of it. Regardless of where are you going, we are sure there are plenty of beautiful things to see, and you don’t want to waste your time cooking your food. And speaking of cooking, stove and pots can occupy a lot of precious room in your trunk. So use these ideas we gave you and pack up some delicious foods that do not require cooking. We’re sure you will enjoy them.